Isolating patients with the hospital superbug MRSA does not stop other patients being infected, a study says. Researchers monitored 866 intensive care patients over a year. Isolation was used for six months but not for the rest of the time, the Lancet said. The team found MRSA infection and colonisation rates remained similar for the whole year - despite national guidelines recommending isolation. Hospital-acquired infections kill thousands a year and cost the NHS £1bn. 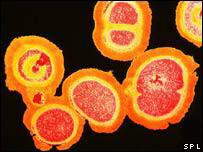 For six months MRSA patients were isolated, but for the other six months they were not, The Lancet said. A fifth of these infections are caused by MRSA (methicillin-resistant staphylococcus aureus). MRSA is particularly prevalent in intensive care wards with one in six patients getting it. The teams, from University College London Hospital and the Royal Free Hospital, isolated patients with MRSA for the first three months and last three months of the study. They also took the standard precautions such as hand washing, using disposable aprons and disposing of body fluids. In the middle six months patients were not moved away from other patients but the other precautions were taken. During the isolation period 443 patients were seen, 92 of which were MRSA-positive on admission. Another 54 subsequently acquired the bug. Some 423 patients were seen during the non-move stage, of which 76 were had MRSA on admission. A further 42 got it. Report co-author Dr Peter Wilson said: "Our findings challenge the prevailing view that isolation of intensive-care unit patients who are colonised or infected with MRSA in single rooms reduce the transmission of MRSA, over and above the use of standard precautions, in an environment in which it is endemic." However, the researchers stopped short of saying this finding should be extended to general hospital wards and called for further research to be conducted. Tony Field, chairman of MRSA Support, a support group for sufferers, said the findings were not a surprise. "Isolation will only work if people tending to the patients are not carrying the bug. "The cycle of infection had to be broken and that is best done at the wound site." And Jean Lawrence, honorary chairman of the Infection Control Nurses Association, said while hospitals do use isolation to prevent the spread of MRSA, no health professional would rely on it alone. "Other precautions such as washing hands are essential." She said the demanding nature of the NHS already meant that not every patient with MRSA would be isolated anyway. "Sometimes patients will be placed in a ward with other people but put at the end of the ward near a sink." The Department of Health said: "This survey emphasises the importance of hand hygiene and the strict application of aseptic (no touch) methods for clinical procedures in preventing transmission." And Simon Williams, director of policy at the Patients Association, added: "This Lancet report highlights the importance of an attack on all fronts to tackle MRSA, and not just via one route. "Screening and isolating patients can only work if other aseptic techniques are also adhered to. "